This Teriyaki flavor is simply described as having a teriyaki marinade so authentic, "that you'll think it was made by kawaii robots in Japan". Beef, teriyaki sauce, brown sugar, pineapple juice, garlic powder, lemon juice, organic worcestershire sauce, black pepper, ginger. The first flavors that come to my palate are a heavy sweet, a light saltiness, and touches of soy sauce. 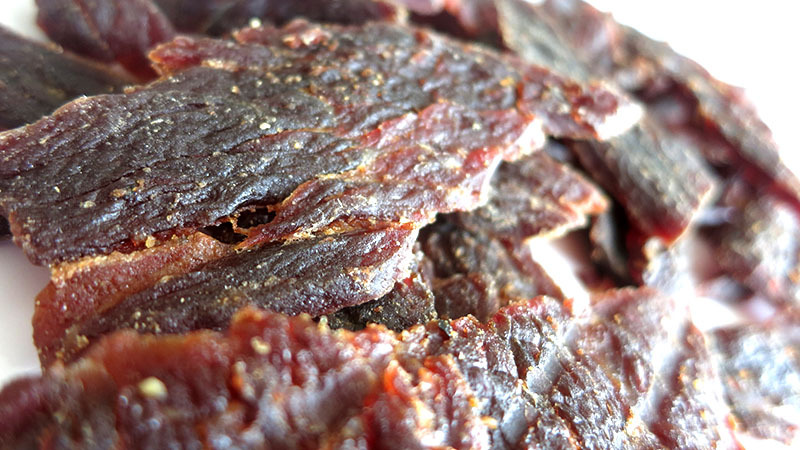 The chewing brings on some hints of ginger, a smidgeon of garlic, and a wee bit of black pepper. I can also pick up a light natural meat flavor. For being labeled as "Teriyaki", particular one the company claims to be "so authentic", it's holds up somewhat. It has thick sweetness that I find in authentic teriyaki, and it has a light soy sauce flavor too. I can pick up a faint ginger, which I think ought to be a bit more defined. However, I'm not getting enough of the mirin wine. This needs a little bit more fermented flavor. 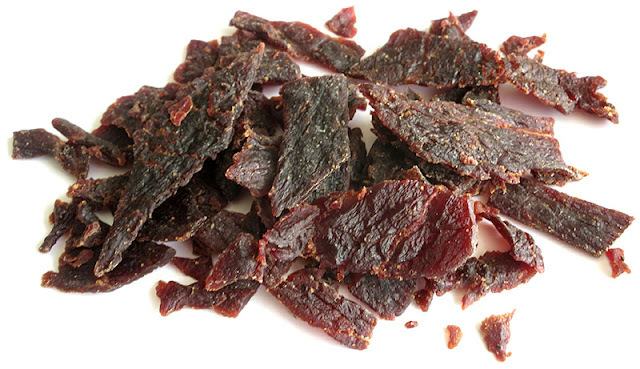 Otherwise, the flavors that define this jerky is largely the teriyaki sauce, with the heavy sweetness. There's a light black pepper spice noticeable, and that's really about it. 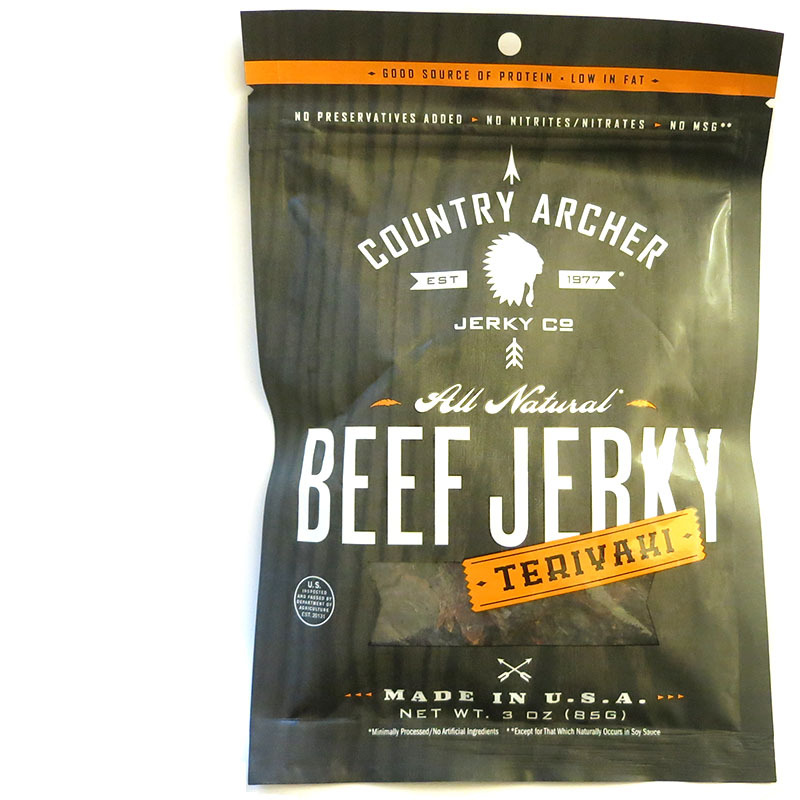 The chewing feels chewy, more comparable to the company's Original, which is actually on par with most national jerky brands. The heavy sweet tends give this meat a sugary-thick feel, but once you chew through it takes on a meaty texture, but not like a piece of steak. There's just a little bit of fat visible, and nothing stringy encountered. 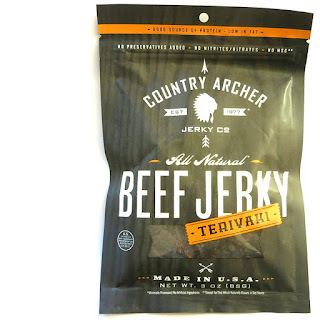 This Teriyaki beef jerky from Country Archer seems to deliver on its promise of an authentic teriyaki flavor, though I felt it could have a bit more ginger and mirin wine. Perhaps in the dehydration process, those subtle flavors become lost. Otherwise, I like the amount of black pepper in this, just enough to create a bit of spice. Otherwise, it's rather unremarkable as a teriyaki beef jerky, with nothing unique and creative to write about. I think its a little bit better than a Jack Link's Teriyaki, or a World Kitchens Teriyaki, but not enough to warrant a four-star rating. I think the bite sized pieces are nice, however I found way too many small bits of meat in the bag.